Who doesn’t want to make their back yard into the most inviting, romantic, entertaining space imaginable? I adore spending sunset evenings sipping drinks with my hubby by candlelite on the deck and watching our children play in the yard. A key to these magical moments is creating an outdoor room, not just a deck or patio space, but a room. Today, Mohawk Home is going to help one Sand & Sisal reader create an outdoor oasis of their own. The 1st step in creating an outdoor room is to provide comfortable seating. I grouped together an all weather wicker loveseat and 2 chairs I’ve had for a few years and piled them with comfy discount outdoor pillows from Steinmart. The 2nd step is to keep the conversation area cozy by pulling the chairs away from the walls and encircling them in a cozy converational area. The 3rd step is to ground the conversation space with a gorgeous, easy to care for, indoor/outdoor Mohawk Rug. My chevron rug is called Herringbone Ginko. 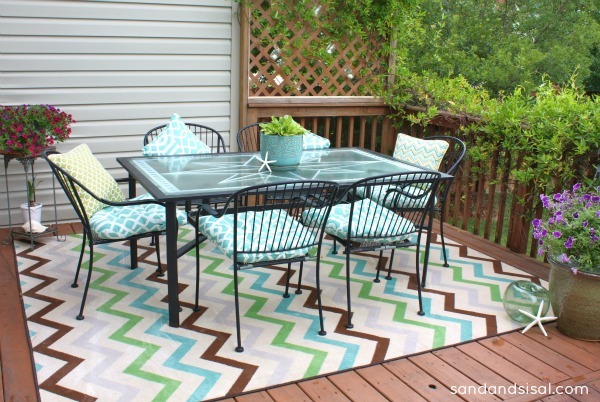 The modern and funky vibe of the chevron rug lended itself well to a seating area on our deck… but I had other plans for it also! How about changing that space into a dining area? I’m constantly moving furniture and rearranging everything. Hubs doesn’t even bat an eye anymore when he comes home to a newly shifted homestead. The indoor/outdoor carpet’s plush pile is oh-so-soft to the touch and uber chic. Our climate is very humid and wet and I do recommend that if you live in southern, wet climate like mine, then you’ll love this rug for a screened in porch or covered porch. Fill any open areas with flowering pots that spill over and shiny accessories like glass floats or lanterns. Bring the indoors outside. One of my girlfriends, Jessica of Four Generations One Roof recently made over her pool area and added a few of these blue Maze Wildaster indoor/outdoor rugs. Adding an indoor/outdoor rug instantly grounds the area and creates a space that is inviting, vibrant and warm. Did you know that Mohawk Rugs are all made in America? This YouTube video tells more about it. Best of all, Mohawk has generously offered to give away a 5’X8′ Mohawk rug of your choice, indoor or out, (up to a $150 value) to one Sand & Sisal reader, so that you can create the most inviting space ever! Please enter the rafflecopter entry below for your chance to win! This post has been provided in partnership with Mohawk Home. All expressed opinions are my own. I signed up at Mohawk, because who doesn’t want a chance to win a rug, but honestly what caught my eye to begin with are the rugs in your post. So pretty. Subscribed to Mohawks Blog spot — Love all of your examples — got my creative juices flowing. We are getting a new roof and front porch and I am looking for ideas to update our current back deck on our 80+ year home. I think a colorful rug will pull everything together like you did! Thanks for the inspiration! That would look lovely on my back deck! I love the way you’ve put it all together too!! I absolutely love the outdoor room you created. The rug is amazing and looks so nice with all of your decorations. It would be perfect for my outdoor space. Absolutely gorgeous!! Love all of them! I am following Mohawk rugs. I love the vibrant colors that they offer. I subscribed 🙂 What a great giveaway! I subscribed to Mohawk Homescapes blog. I also checked out the rugs on Mohawk’s website and have 12 of them saved in my gallery. We are about to re-screen our back porch and add new flooring. A Mohawk rug would make the area perfect. It’s just gorgeous, friend. LOVE IT!! And Love Mohawk products! We are finally building our dream home and I will have a screened in porch. These Mohawks rugs are so great…your set up is beautiful. Inspiring! I’d love to win a rug from mohawk! I subscribed to the mohawk blog. Thanks for sharing another great site! I subscribed! Love The Penny Loafer Design :-)! 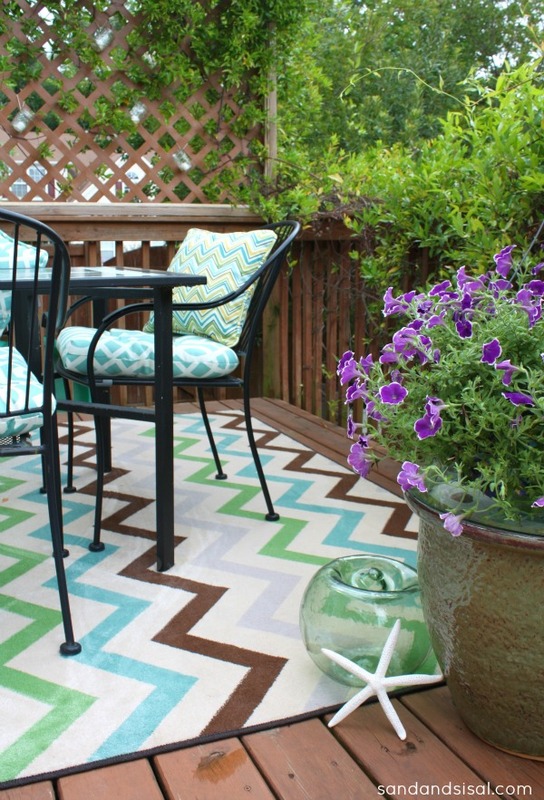 I would LOVE to add some color to my deck with a fun carpet! I would love my back deck to look more pulled together and room like! Thank you for the chance! I signed up for Mohawk rugs blog. I am so glad you posted about this because I just happen to be in the market for at least two rugs, up to five. The colors are beautiful! i subscribed to Mohawk’s blog! 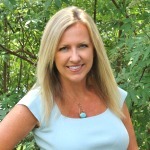 I subscribed to Mohawk Homescapes blog; looking forward to seeing what they bring! This would be great to win. I need something for my patio. Thanks. The rug makes it seem like an outdoor room! Love it! I subscribed to the Mohawk blog. 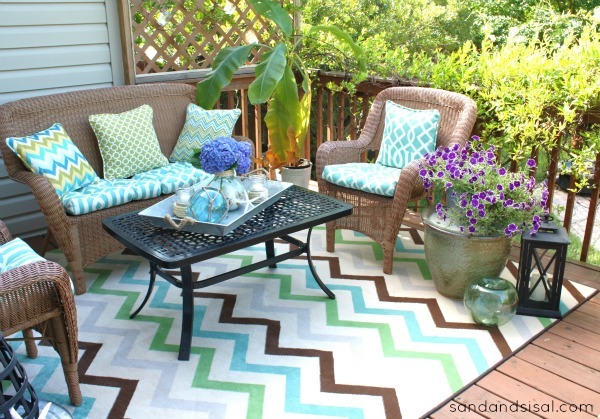 I love how these rugs brighten up the outdoor space. Thanks for sharing! I subscribed to Mohawk Homescapes blog! I’d love to win a beautiful Mohawk rug! I subscribed to Mohawk Homescapes blog …… In desperate need of a perfect rug. I subscribed to Mohawk Homescapes blog. I subscribed to Mohawk. One of those rugs would do wonders for my patio. I am already subscribed to the Mohawk Blog. Their rugs are beautiful. Thank you. They are very beautiful rugs!…Just love the patterns and colors! Subscribed to Mohawk Homescapes…love their rugs. I love Mohawk rugs! They are top quality. Beautiful! I am now following their blog! Oh, we just finished our new deck, so I need a rug! An outdoor rug would be great! Thanks! I love your friend’s rug! It is beautiful! I subscribed to Mohawk BlogSpot! I love all of the vibrant colors and patterns they have. I just signed up for the Mohawk blog!! 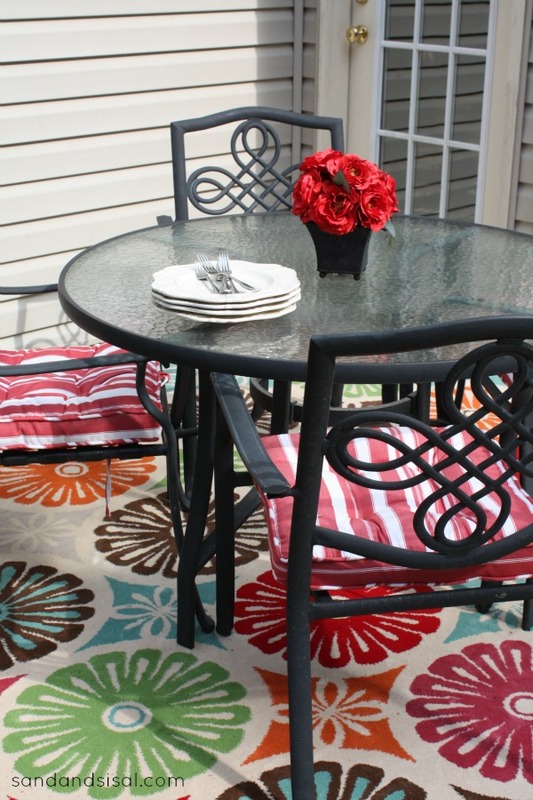 Wow, I didn’t even realize what a difference an outdoor rug would make, but now I NEED ONE!! 🙂 Thank you for the chance! 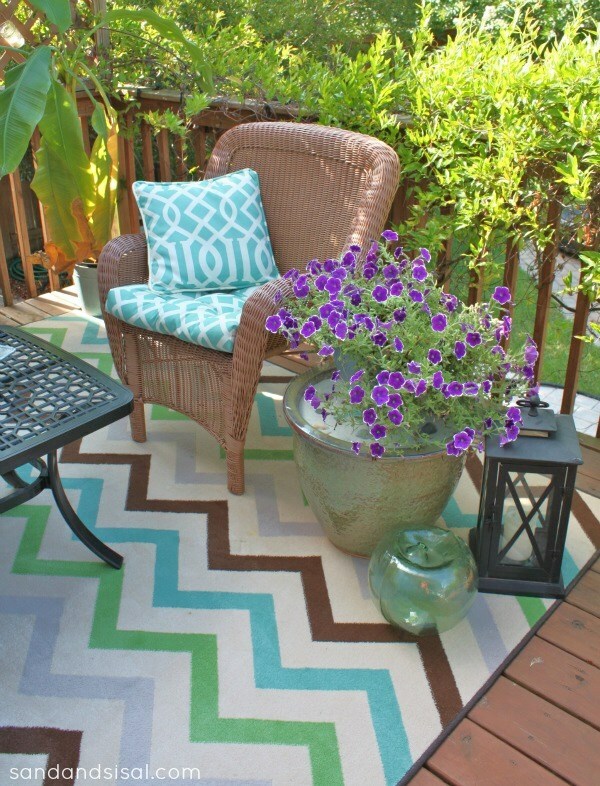 I absolutely LOVE the chevron rug and I would LOVE to win it! I could never afford one of these rugs….it is gorgeous! I started following Mohawk! 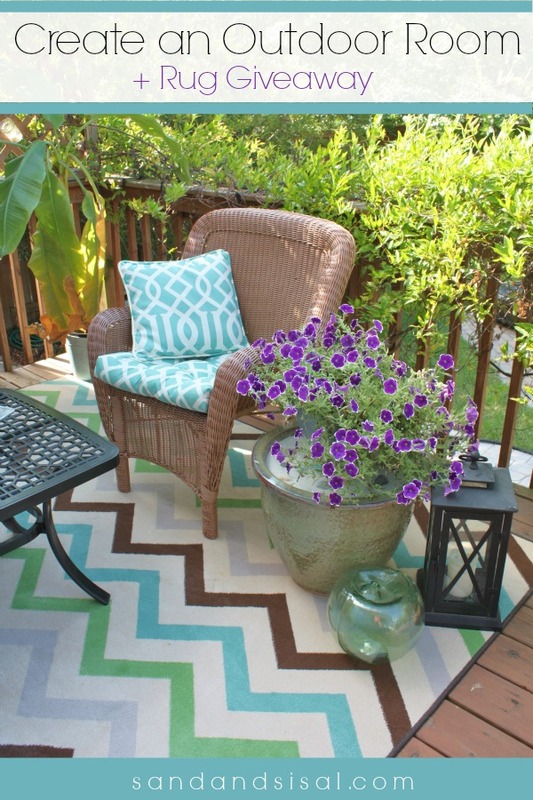 I need a new rug for our patio whether I win or not, so I subscribed to their newsletter! I subscribed to the mohawk blog, I’m in love with this rug! I subscribed to the mohawk blog. Thanks for offering the great giveaway. I recently found your blog and I LOVE your style, advice, and tutorials! I have done at least three of your DIYs since finding your site 😉 So happy to bring a little of my Southern roots into my Northwest home! Great give away! My porch is a work in progress and this would be great! Love these mohawk rugs! Would love the chance to win. 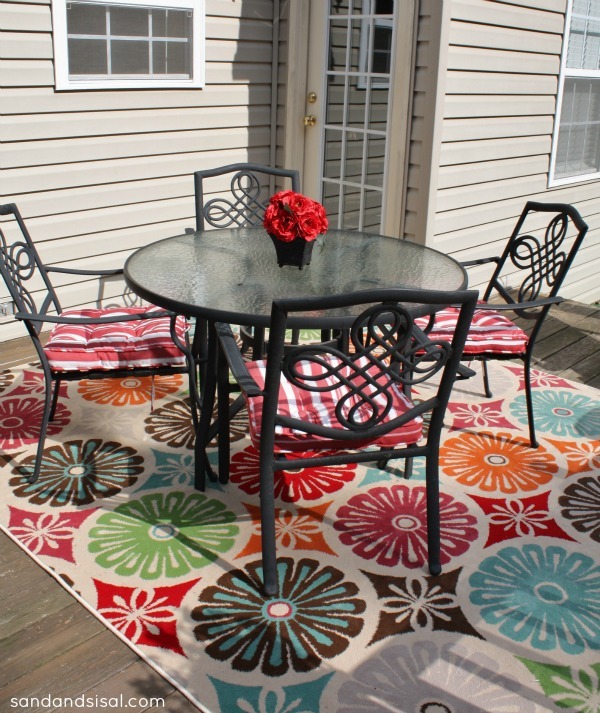 love the whole set up, especially the rug…..Our patio looks deserted!!!! I subscribed! I have been looking for an outdoor rug and I really loved the chevron one:-) Thanks for the great advice on how to put it all together. I’m slowly but surely updating my deck. 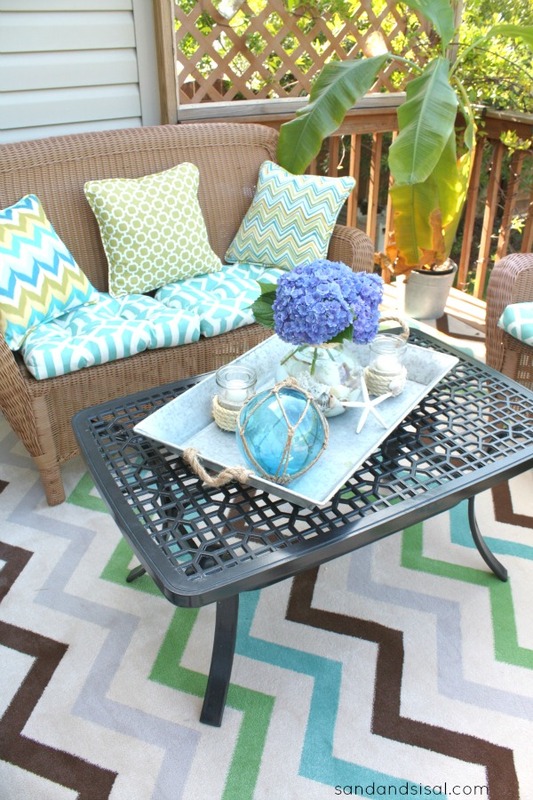 I really love the chevron rug that Kim featured in this post! These rugs are so beautiful! I LOVE the outdoor room you’ve created! I need to do this on my porch. Thanks for sharing! So bright & cheerful! Looking to replace my old beige one this summer… Hello Mohawk! Love your beautiful space and the Mohawk rug really finishes it. Your outdoor space is inviting, need to make mine the same ! 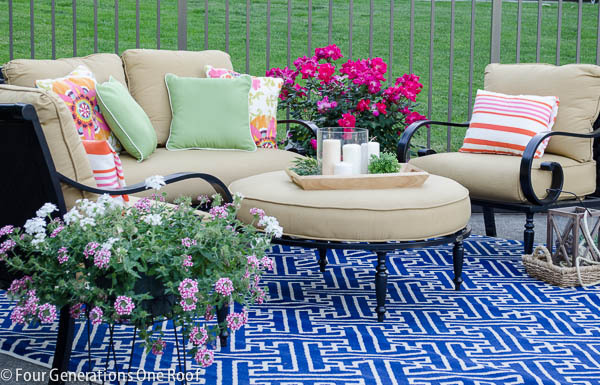 The rug really pulls the outdoor space together, doesn’t it? Love the color!! I subscribed to the Mohawk Blog. Love your rug choice! this would look great on my deck or patio! Your outdoor seating areas are gorgeous! I subscribed. Your deck looks so cozy! Love the rug. Great giveaway! I subscribed to the Mohawk blog! I subscribed!!! Crossing my fingers, we really need some rugs! I subscribed to the Mohawk blog! 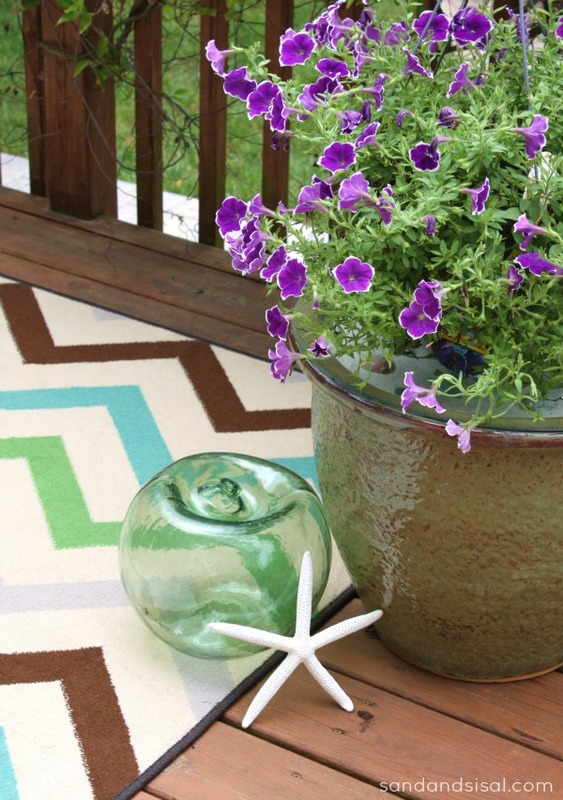 I love these outdoor rugs! I have a cabana I set it up it turned out nice but my rug is just a dark color would love to brighten it up ! I am signed up and subscribed and 100% on board! Love this opportunity to win a new rug for my new place :o) Thanks! I would love the chevron rug in your photos! I Love these rugs and haven’t seen them before thanks for sharing!! I subscribed…I have been wanting to get a carpet for the sitting area on my deck..this would really look nice! I would love any of the rugs. We have a large deck, and one of these would be a welcome addition. I followed and subscribed! Please pick me!!!! Oh, I would love to win a Mohawk rug! Such a nice way to add an inviting pop of color! Great giveaway! I subscribed to the Mohawk Homescapes blog. I think a rug will brings all your furniture pieces together and make it feel homey. Love the look. I subscribed to the Mohawk blog. Thank you! I already subscribe to Mohawk Homescapes blog. Beautiful rugs! Several I love to choose from!